One of Trevor's best friends, Matt, turned 28 last week! Trevor put together a tri-tip dinner to celebrate his birthday. As an appetizer I brought Goat Cheese with Honey and Toasted Almonds. I also made this appetizer last weekend when I visited Amber and Ashley in LA! It's pretty addicting to say the least. Stephanie made this appetizer for her Halloween Party awhile back. Stephanie manages We Olive on Chesnut Street in San Francisco and she always has great food/drink ideas! Ever since Stephanie's party this dish has been my "go to" appetizer. The dish is easy to put together, but looks elegant, original, and sophisticated. The toasted bread and almonds soften the goat cheese and everything just melts in your mouth. 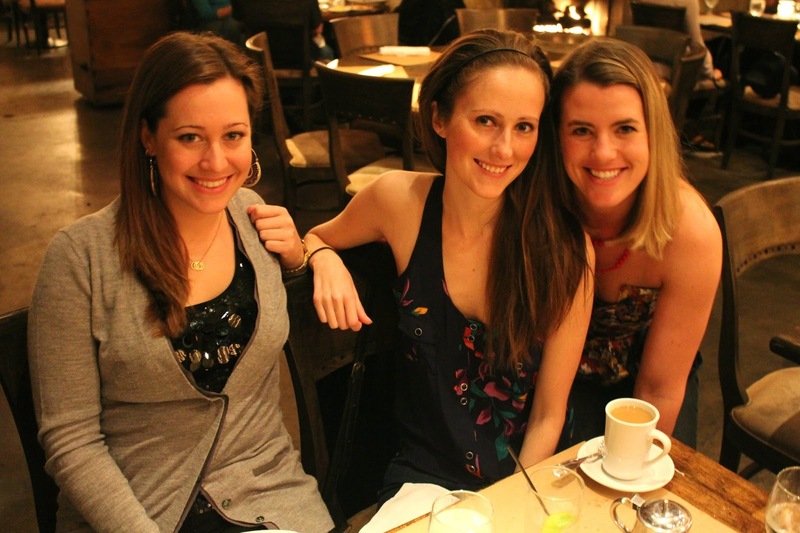 Ashley, Amber, and I in LA last weekend! Too mouth watering to hold back while taking pictures! Place log of honey goat cheese on platter. Top with enough honey to cover goat cheese and run onto plate. Top with Toasted Almonds. Surround with toasted baguette slices. Holy moly that looks A-MAZING! That looks amazing and so simple to make!